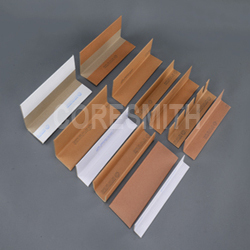 Bharath paper conversions is one of the leading manufacturer and exporter of angle edge board. Our angle edge board provides protection for the materials during shifting of goods. It is an ideal solution for damage caused during transport and handling of goods. By using angle edge board, we aim to offer the customers a measurable advantage like, replacement of expensive packing material, environmentally friendly, protects the product against strapping damage. We provide highly effective products at the most reasonable price.